Gemma is currently not available to accept new requests. Licensed: No.17/00878 DBS checked We are 2 Dog Lovers. I am a retired teacher at home all day looking to welcome dogs for their holidays. We live on the Goyt valley, and long walks twice a day and lots of cuddles are in store for any dog that comes to stay with us and our friendly little dog Pepper. Pepper is a small dog and loves playing with other dogs, we are just a minute walk from a large playing field for lots of ball chasing, and the field leads on to the Goyt valley for miles and miles of paths, valleys, rivers and parkland which we walk around every morning and evening. We have an enclosed garden for the dogs to run around and we have both owned various shape and sized happy dogs all our lives and look forward to having your dog come and stay with us. Gemma has now retired from teaching and we are dog boarding to make a little extra money to spend on the Grandkids whilst doing something we love, caring for dogs. Jeff still works but loves a morning 4 miles round trip daily dog walk through the amazing Goyt Valley and Woodbank and Vernon Parks. Don't take our word for it. Call us and come and meet us so we can reassure you that we will do our best to care for your dog in the way that you want. We know how scary it is to have to leave your dog with someone you don't know. We can’t recommend Gemma enough. We left our 4 month old puppy for the first time which we were nervous about doing at first but straight away Gemma was really welcoming, made us and the pup feel really comfortable and kept us updated the whole time. Thanks for a great all round experience! I’m sure we’ll be back again soon! Gemma created a messaging group and sent me daily photos and updates while I was away. 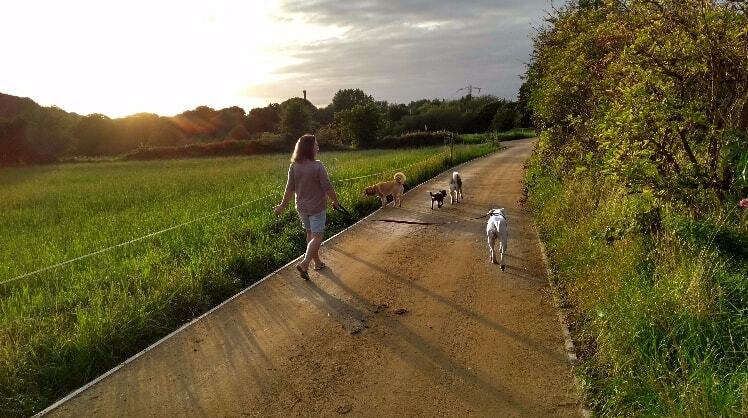 My dog loved the company of the other dogs she was looking after, and was spoilt with so many lovely walks. I highly recommend using Gemma's dog sitting services and I will be using her again next time I fly from Manchester.